Shikag Lake offers more than 130 miles of remote scenic shoreline. With an average depth of 20 feet, the lake has no large deep sections where fish can hide. 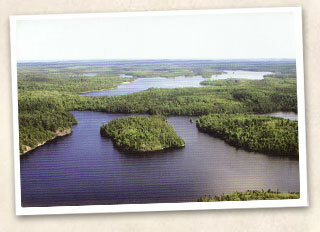 Making it one of the best places in the world for fishing walleyes, northerns, and smallmouth bass. As you fly into Moose Point Lodge, you will see why our many previous guests consider our location "a sparkling gem" in the beautiful Canadian wilderness. The rustic log exterior of Moose Point lodge opens to a warm and comfortable setting that invites guests back after a day on the water or in the wilderness. Moose Point has taken a proactive approach to fisheries management of Shikag lake. A conservation program was implemented 6 years ago which required the release of all northern over 27" and walleye over 18". At that time 2 fish of each species were allowed to be taken home under the size limit.For the last two years Moose Point has moved to a catch and consume program. This means you can eat fish while at Shikag, but can not take any home and have afforded all bass over 16" release protection as well. The possession limit remains 2 fish per species. We believe this is the best way to develop and maintain the full potential of this great trophy lake. We were one of the first conservation and catch and release lakes in Northwest Ontario. This policy has had great success as sizes and numbers of fish have increased dramatically. Not only have we seen the size and number of trophies (walleye over 28", northern over 40" and bass over 19") go up but also the strength of the year classes that ensued from their release. "Just a short note to thank you and your staff for our great trip of last June. I am a part of the Capozzi - Towns - Hill group. We had perhaps the finest trip I've experienced in the eight consecutive years I've fished in Ontario. This was my Son's second trip. The fish in the picture is his largest walleye. This fish was 27 ½ inches. He lost a bigger one later in the week. What amazed me was that eleven of thirteen of our group caught walleyes this big or bigger. The largest of the week was 31 inches, almost matching the 32 inch walleye caught last year at Moose Point by our group. My hat is off to you, catch and consume is producing a phenomenal fishery! In retrospect I regret only that with so many PIG WALLEYES and acrobatic smallmouth bass that we failed to target Shikag Lake's northern pike. Anyway a hearty thank you to you and your staff for the twinkle in my eye that is certain to last until we again visit "the only place where time slows down" Moose Point Lodge." For walleyes jigs tipped with minnows, leeches or nightcrawlers generally work best, though twister tails and crankbaits do have their moments. The key to catching walleyes is having your bait on the bottom and moving slowly. 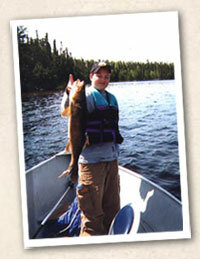 Tackle is extremely important to catching walleyes. If you do not have a light to medium light graphite rod with fast action think about purchasing one. It is extremely hard to feel a walleye biting on a noodle rod or a broomstick. The lighter the jig the harder it is to feel the bottom but the easier it is to feel the fish hit. Experienced fisherman use lighter jigs while novices should use heavier jigs because your bait must be on the bottom. The best jig head colors are white, yellow, chartreuse, and pink though you may want to experiment with other colors. Some people do quite well with lindy rigs tipped with a minnow. We sell minnows at the lodge. The price depends on how much they cost me, but it should be about 4.50 per doz. You can bring nightcrawlers in bedding across the border but not minnows or leeches. 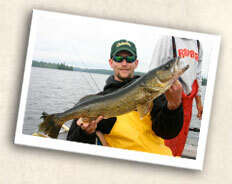 Northern will also hit a jig and minnow and many 20 pound pike have been caught walleye fishing. They also like a lot of flash and bigger baits. Spoons should be a least 3 inches long and they will take them as big as there made. Some popular colors are silver, red and white, and five of diamonds, other colors work well too. Deep diving crank baits also work well, larger sinking rapalas, and shad raps as well as small to medium size musky baits. 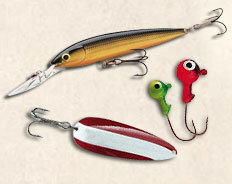 Spinners like Mepps musky killers, lusox, and Panther Martins in various sizes will also catch fish. In cooler water conditions, fish with a little smaller bait at slower speeds. As the water warms up larger baits worked faster is the key. Northern have very sharp teeth and will bite through your line if you don't have a wire leader. Bait casters work well for northern, but give some people fits. Your rod and reel must be able to handle the size of your lure. Smallmouth are caught with the same type of tackle as walleyes though crank baits and spinners are more productive. Long casts around boulder strewn reefs and drop-offs work well to keep from spooking fish. We do have some tackle for sale at the lodge.